You should use a continental (2) grip. The base knuckle and heal pad should be on 2. Beginners struggle with this grip as they swing directly at their target and do not pronate. So as a result the ball goes directly towards the side fence. The swing is a throwing motion which resembles a figure of eight. But usually when you put a racquet in someone hand, it resembles anything but a throw. 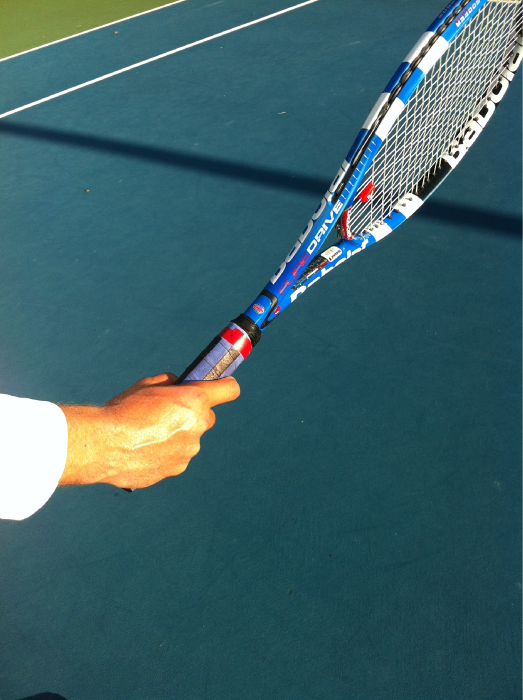 The racquet comes in between your ear and your elbow, maintaining a 90- degree angle between your forearm and upper arm. 3. Talk on the telephone. Your elbow and hand position resemble the position you would hold a telephone. 5. High five the giant. Start with your feet slightly more then shoulder width apart. The from foot should be at about a 45 degree angle facing the next post to the right (right hander’s), the back foot should be parallel with this baseline and the arch should be inline with the heel of the front foot. You want to coil your body so that you can uncoil. It’s rotational. A lot of coaches over emphasize the legs to soon so players end up developing a elevator type body action which doesn’t help produce much force. You want to load your body weight on your back foot so that it helps you turn more as you rotate your shoulders back. The power is initiated from the ground up. According to studies done by Vic Braden and Dr. Gideon Ariel you gain 1.7 times more speed from proper utilization of the kinetic chain, versus only relying in muscle contraction. Ideally at the point of contact your body should be in a straight line, at a 45 degree angle into the court and 45 degrees to the right (left for lefty). This is known as your power-line. Your shoulders should be facing the net-post to the right ie. 45 degrees away from your target. Eyes should be focused at the point of contact to help prevent the body and head from shifting and opening up. You can lose up to 30 Mph if you open up too soon. Ideally you should hold the ball as if you holding a glass of water or even with your palm facing completely down. This helps prevent wrist movement and the toss from going over your head. 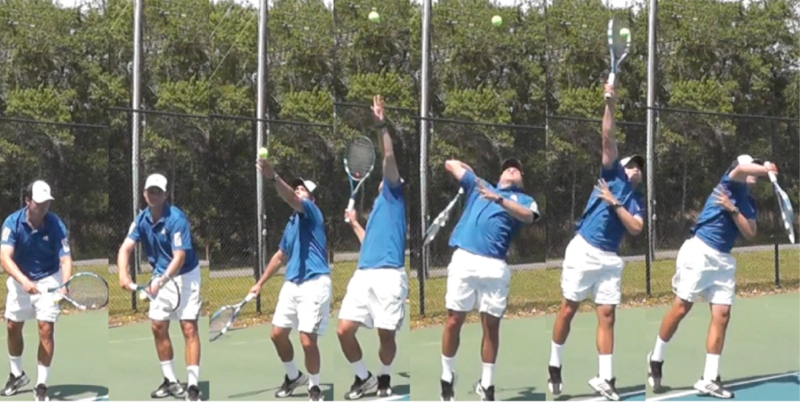 Also it is impossible to toss in front and maintain your shoulder turn with a traditional up down tossing arm movement. The tossing arm should trace a movement resembling a letter J. As the hand rises it will also move forward in an arcing motion.